1.3 Micro transactions – Is Hustle Castle pay to win? In Hustle Castle you are the master of your own castle. Which sounds fun, but is the game really worth playing? Let’s find out in today’s review of Hustle Castle. In our review we’re going to go over the graphics, the gameplay, micro transactions and give our verdict about whether or not the game is worth a download. The game is available as Hustle Castle: Medieval Life on iOS and Hustle Castle: Fantasy Kingdom on Android. While they have different names, the games are exactly the same so this review applies to the game on both platforms. While everyone has a different style of graphics that they like, we have to say that we really enjoy how Hustle Castle looks. Especially for a mobile game we believe that the graphics are very good. We also really enjoy the music in the game, for us it makes the game a lot more immersive. If you want to get an idea of what the gameplay and the music is like in Hustle Castle check out this video, it should give you a good idea of what to expect graphics and music wise. Overall we would rate the graphics in Hustle Castle 4 out of 5 stars. The gameplay is the most important aspect of any game, and in Hustle Castle the gameplay is very fun. The game features 3 different key components of gameplay: Building your castle, PvP (Players versus Player) and PvE (Player versus Environment). The castle building aspect is something that you might have experienced in other mobile games, it’s certainly not unique to Hustle Castle. While that might be the case, Hustle Castle does it well. You start off with a small amount of rooms and dwellers and as you progress through the game you can keep expanding your castle. Eventually your castle will be huge and this sense of progression really makes the game enjoyable. You also have the option to obtain pets in Hustle Castle that are free to roam your castle. If you want more information about pets check out our pet guide. The PvP aspect of Hustle Castle is also quite good. To start PvP you scout your enemies on the world map which allows you to see their power level. If your power level is higher than theirs you have a good chance of beating them. When you beat a player in PvP you have the option to steal their resources which you can then use to make your own kingdom even stronger. There’s also the possibility to use spells in PvP. These spells can be quite powerful and allow you to defeat a player that you normally wouldn’t be able to beat. Therefore you should use the spells wisely. The PvE component of Hustle Castle is in many ways quite similar to the PvP component. The main difference of course being that instead of fighting another real human you’re fighting against an AI. The AI is in the form of monsters that you can defeat. The game has a storyline that you can complete through the PvE aspect of the game. It’s quite a basic story, the bad guys have kidnapped your princess and it’s up to you to rescue them. While the story is quite basic, that doesn’t mean it’s not enjoyable. Overall we would rate the gameplay in Hustle Castle 4.5 out of 5 stars. Micro transactions – Is Hustle Castle pay to win? While you can do a lot in the game without making use of microtransactions we have to admit that there is definitely a pay to win aspect in Hustle Castle. The premium currency in Hustle Castle is called diamonds, and these diamonds are quite an important part of the game. They make progressing a lot easier and definitely give you an advantage over free to play players. However, there is a way to obtain free diamonds that we’ve covered in our post about cheating in Hustle Castle. 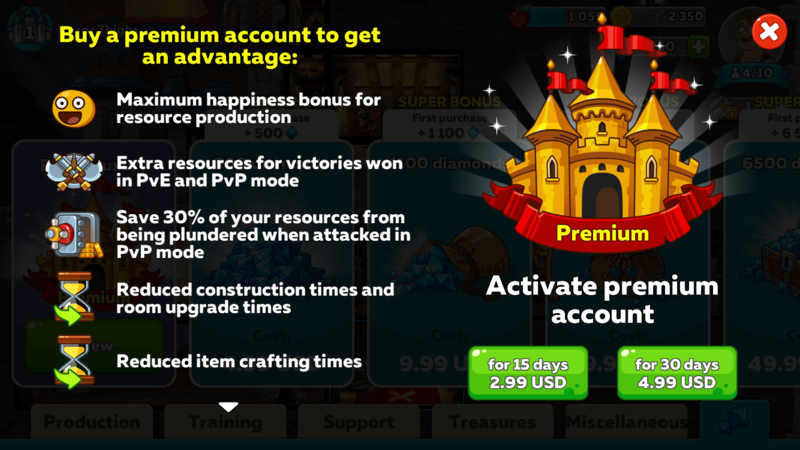 There is also the option to obtain a Premium Account through in app purchases. This will cost you $2,99 for 15 days or $4,99 for 30 days. A premium account will give you certain bonuses in Hustle Castle. If you’re looking for a game without micro transactions then you might want to look elsewhere. It is possible to stay competitive in the game without spending too much money, but it’s going to be quite a challenge. Overall we rate the micro transactions 2 stars out of 5. It is possible to play the game without spending money, but doing so will put you at a pretty big disadvantage. The game’s strong aspects are the gameplay and the graphics. It’s truly a blast to play and the graphics and music will surely keep you immersed in the game. The weak parts of the game are the amount of micro transactions and the fact that at times it can feel quite pay to win. 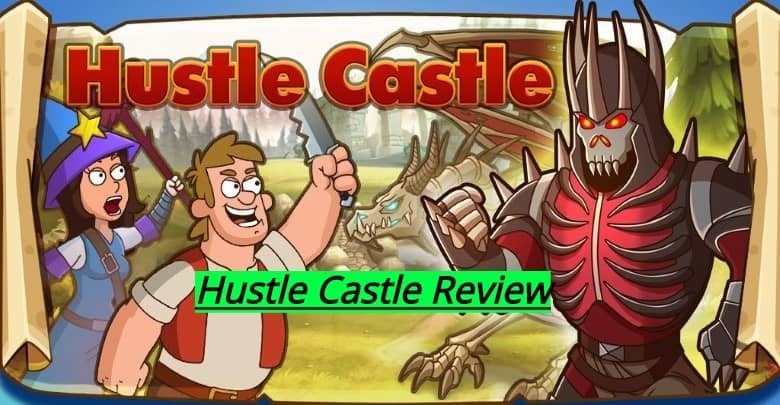 If you’re looking for a game that has a strong PvP and PvE aspect as well as an enjoyable castle building experience and you’re willing to accept micro transactions then Hustle Castle is a game that might definitely appeal to you.